End of Season update. May 2038. Fans Player of the Season. (25a) Martínez (Bal) (2025) *. Goal of the Season. Miguel González (BAS) (Bal). The goal itself is pretty underwhelming, until that is you see that it puts us 1-0 up against PSG. Signing of the Season. Miguel González (BAS) (Bal). Young Player of the Season. (34a) Merino (LHeart) (2034) *. I still have (19i) Zakaria. (F.Pro) at the club, (along with a few others), on a non-contract basis purely because of their personality and/or their determination levels. You know the save has been going a while when the 1st batch of youth intake players start to retire. Marseille in for of our youngsters. Jun 2038. (37a) Théo (F.Amb) (2037) *. I don't want to really sell any 5.0 PA players, but I am particularly keen not to sell a 5.0 centre-half. 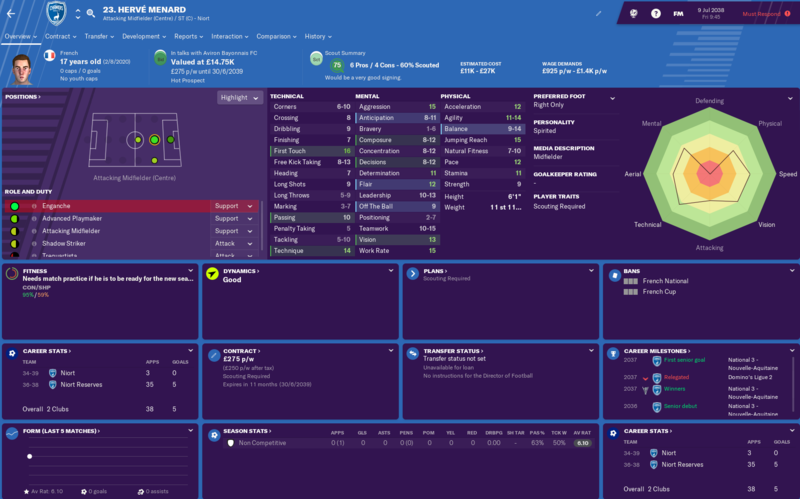 I know he hasn't even made his debut yet and is only 16 years old, but my best centre-backs are only 3.0 CA, (which is the main reason we are in Ligue 2 again), so this bloke is not going anywhere at the moment. He's got 2 more years on his contract and then an option for another 3 after that, so to be honest I would silly to let go of him now. I hope you can keep him. What a great talent! I'm not sure he is to be honest. I've got quite a few like him. I've got 16x 5.0 PA players at the club, while at the same time I only have 1x 4.0 CA player in Miguel González (BAS) (Bal) and nothing higher than that. To put things in perspective, if Miguel González (BAS) (Bal) is the best player at the club and is accurately rated at 4.0 CA, and we have all these players accurately rated at 5.0 PA, then things are looking very good indeed. The reality though is that some of these are likely to be not actually that good. After I had declined the deal, I decided to set an asking price for him, under which all bids would be auto-refused. I didn't really know what amount to set because I don't really know how good he is going to be, but I set the asking price at £5,000,000 and thought no more about it. Today we have received this bid. £1.5M up front for a 16 year old who has only made 4 appearances for the Reserves is a LOT of money, but I have to remember that last year I was in Ligue 1 and hope to be back there again in the next couple of years. In that respect £1.5M probably isn't that much money, but I also have to remember that French Ligue 1 is not the same at all as the English Premier League in terms of financial rewards. If I can get close to £5M for absolutely anyone then I will probably accept it at the moment on the proviso that there are so nice sell-on fees involved. Monaco have joined the race for him. They have also bid £1.5M for him despite me having the asking price set at £5M. I'm thinking about sticking his valuation up to £10M, but lets's just see what happens as it is for the time being. In a save such as this, you will never see me crank the expectations up. There is just no point for a few more quid. I pick the lowest option I can every single time. Under-promise and over-deliver is the mantra to be followed. What I say to the players and what I might personally want to achieve is completely different to this. This is just between me and the board. Although the likes of Athletic Bilbao pretend that they have a hard-coded Basque only rule, the reality is somewhat different. Cristian Ganea for example is still an Athletic Bilbao player now, but he was born in Romania and yet they still thought it ok to sign him. Their thinking is that because he had played for Basque clubs a minor, he was by their interpretation a "Basque player" and available to join the club. Bixente Lizarazu was a French Basque player who they signed in the 90's, but he was at least Basque, (albeit French-Basque). Aymeric Laporte on the other hand was also French, however this time he was not French-Basque but hailed from Agen. Antoine Griezmann has never been a Bilbao player, but there was a discussion regarding his eligibility to be signed by Bilbao before he joined Madrid, and the conclusion from the Academy Director was that his training from a young age at a Basque club made him a "Basque footballer". The suggestion is that a player can sign for the club while he is still a minor, and that this will mean his "footballing education" will at least be part-based in the Basque region. 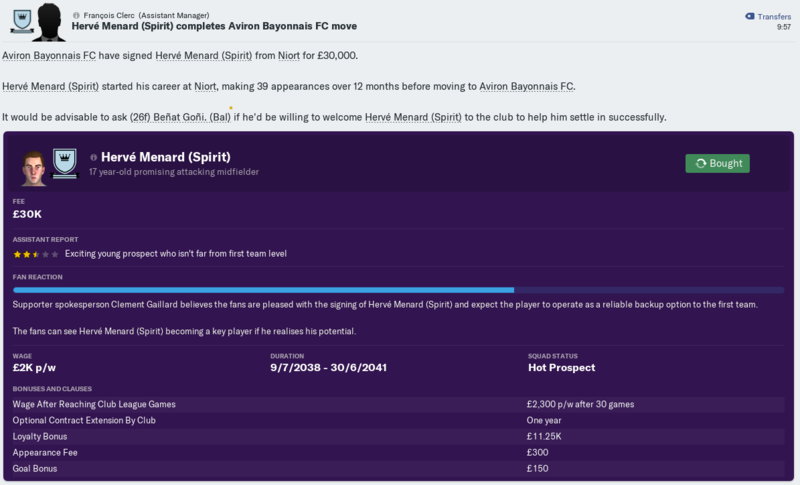 With that in mind, I have found a test subject, Hervé Menard (Spirit), who was identified by my DoF as a transfer target, and I am signing him to see if he will be given Basque as a 2nd Nationality. If I sign him and he doesn't gain Basque as a 2nd Nationality then I will of course not play him, but I have a feeling that he will be given Basque as a 2nd Nationality. This is not completely about this player in particular, but I want to know what the situation is going forward to see if this is an avenue open to me for future signings. He has signed, for a nominal fee of £30,000 and I will now see about his 2nd Nationality. It hasn't worked and he still hasn't got Basque as a 2nd Nationality. I think it works, but I think the player can only be 16 when he joins. Hervé Menard (Spirit) might be here, but he won't be playing. I think it works, but I think the player can only be 16 when he joins. Yeah, its exactly that, if you're going to naturalise people you have to get them pretty quick after the youth intake. I'm thinking for my save that if they're trained in / born in a town near the edge of the Basque area I'll nab them. But Laporte really was Athletic just making an exception because he was really talented. Job offer number 20. Jul 2038. FC Metz while 10th in Ligue 2. Dec 2025. Dijon while 20th in Ligue 1. Dec 2025. Troyes while 17th in Ligue 1. Dec 2025. AJ Auxerre while 11th in Ligue 1. Nov 2026. Strasbourg while 20th in Ligue 1. Jan 2027. EA Guingamp were 14th in Ligue 1. Jun 2028. Stade Lavallois were 1st in Ligue 2. Jun 2028. Lille while 12th in Ligue 2. Oct 2028. FC Lorient while 6th in Ligue 2. May 2030. Nancy while 20th in League 1. Jun 2030. 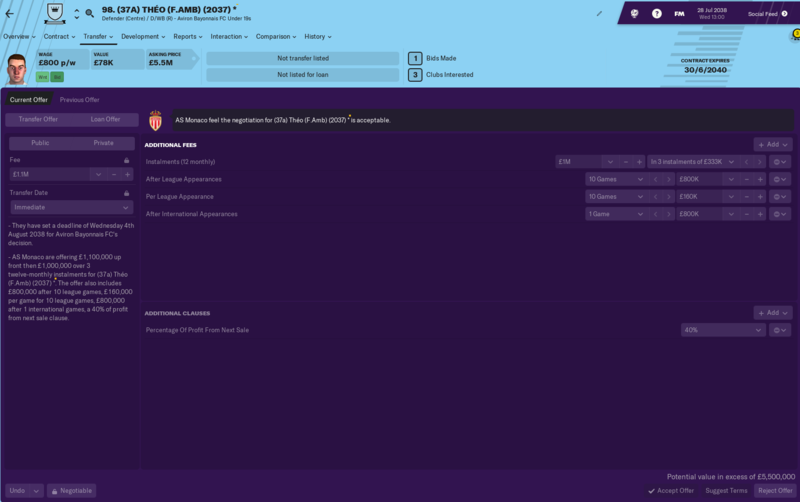 AC Ajaccio while 1st in League 2. Jun 2030. FC Lorient(2) were 17th in Ligue 2. Jun 2031. Stade Lavallois(2) while 17th in Ligue 2 in Aug 2031. 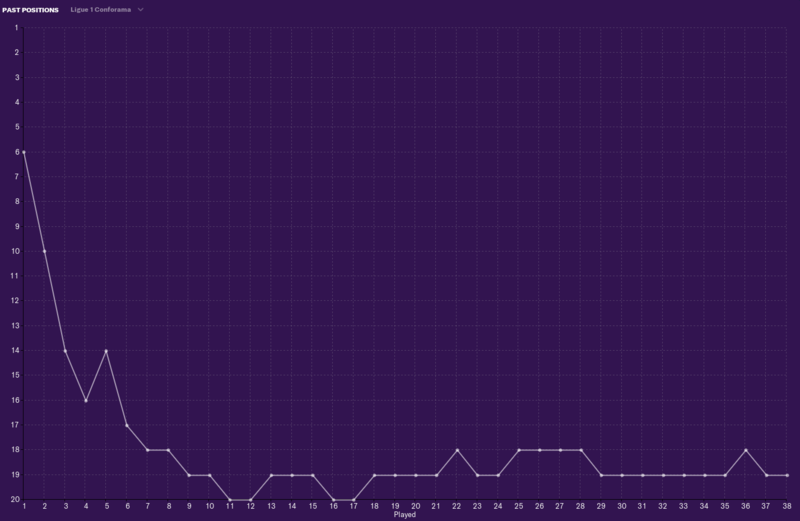 Nancy(2) while 6th in Ligue 2 in Dec 2031. Italy National Team. Jul 2032. Lille while 2nd in Ligue 2. Feb 2033. Saint-Etienne finished 7th in Ligue 2. Jun 2033. Italy National Team(2). Jul 2034. France National Team. Jul 2038. The board have accepted an offer from Monaco for (37a) Théo (F.Amb) (2037) * in the amount of £5.5M. It's only £1.1M up front but with add-ons that I can count it adds up to £5.3M + 40% of next sale profit. I have the option to protest this deal, but as there is a 40% of next sale profit included I don't think I will. Is it annoying? Yeah, a little bit, but he hasn't ever featured for us so it's hard to miss someone that has never featured for you. There is also another player that we have lost. (37b) Jon Jiménez (F.Det) * is 16 year old GK who I couldn't get to sign a full contract. While he was still on a youth contract, Rennes came in and sneaked him away from under us. 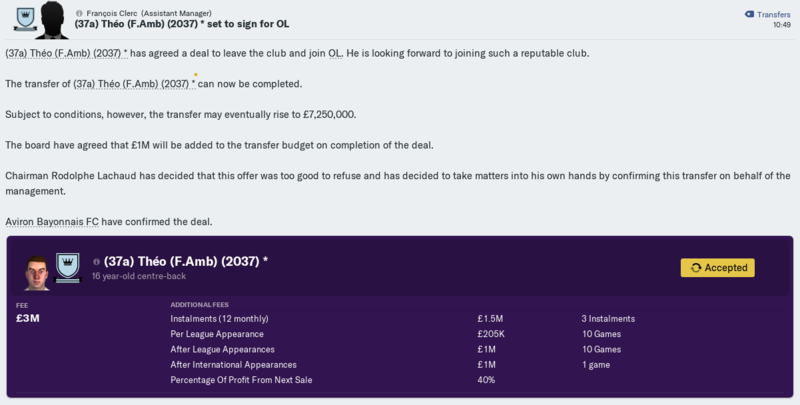 He was a 5.0 player, but we have other options at GK so this isn't a disaster at all with the others players already signed down to long-term deals. It appears as if this isn't actually the case. 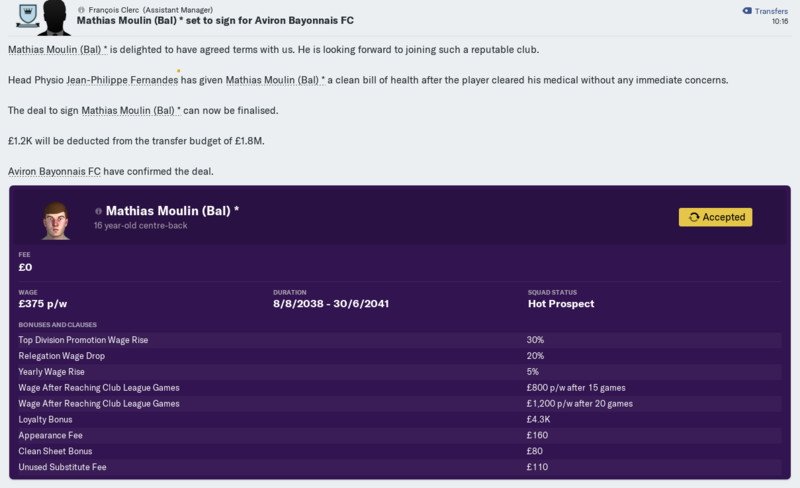 My DoF found another player, (a centre-half this time), called Mathias Moulin (Bal) *. He was signed for a nominal fee of..... actually he seems to have been signed on a free with just £1,600 compensation. He's still not classed as Basque despite being signed as a 16 year old. I guess that I will have to sign a 14 or 15 year old and see if that works. This is more than was originally offered and I'm not really sure why. We had bids in from Monaco first and then Marseille, but I'm pretty sure that it wasn't this big. 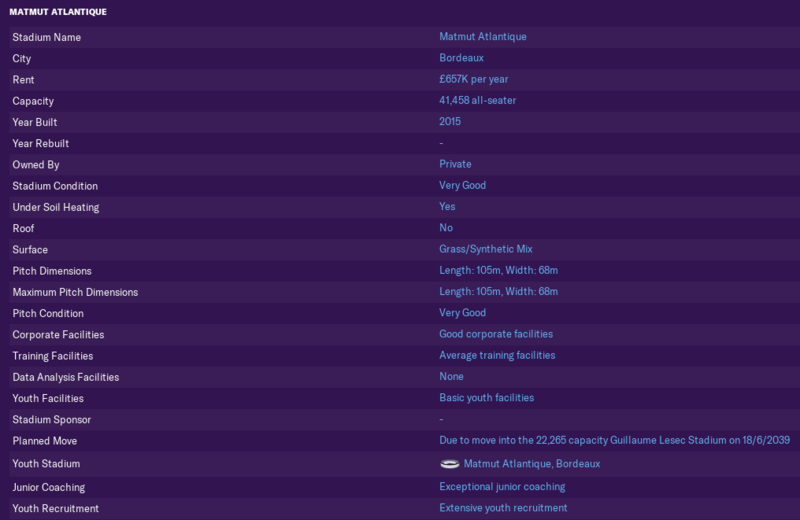 I was initially happy with a total fee of £5M just so long as I also got a 40% profit clause on top. (As time goes on this will hopefully change to sale price rather than profit). This fee is £3M up front plus £1.5M over 12 months, £2M over 10 games, £1M after 10 games, £1M after 1 International appearance plus the 40%. I'm not sure that he will even make a Senior appearance for...... oh, this is Lyon and not Marseille. This is why it's a different value. I'm not sure he will ever make his debut for Lyon never mind about making an International appearance, but we still get a guaranteed £4.5M. My only issue with this is that they are only adding £1M to our transfer budget. Other than that I think the deal is good for us and I would be delighted for him to do well at Lyon and make an impact on both the Senior side and International Team. Although it's stated above that only £1M would be added to our transfer budget, in fact £2.46M has been added to our budget. (34b) Mikel Ochoa (Bal) *. 2 appearances for (FRA) U20's. (35a) Iker (Bal) (2035) *. 6 appearances for (FRA) U20's including 1 assist. 10 appearances for (FRA) U19's including 4 assists and 1 goal. (35b) Renault (Temp) *. No appearances. (36c) Schmidt (F.Loyal) *. 1 appearance for (FRA) U19's. (36e) Koldo (Det) *. 5 appearances for (FRA) U19's. (37a) Théo (F.Amb) (2037) *. No appearances. Jun, Jul & Aug 2038. Pre-season went as pre-season goes. 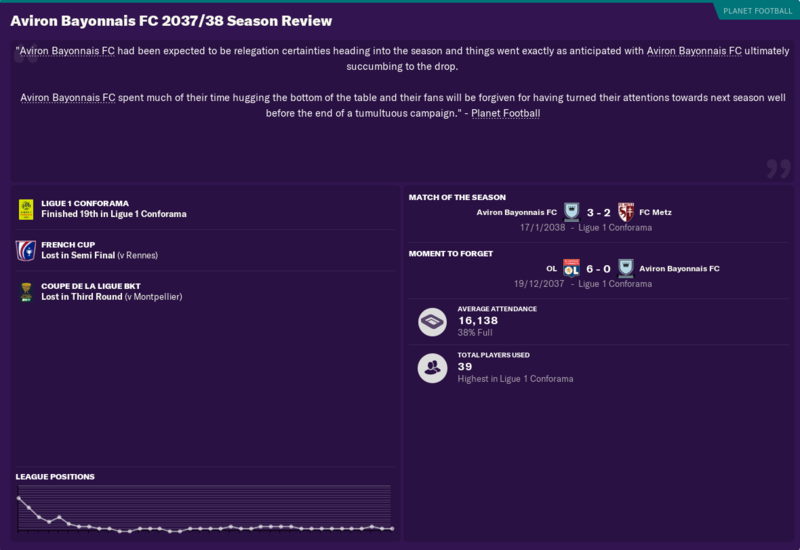 After last season's debacle with 442 I haven't learnt my lesson and tried a new tactic this season again, this time a 4321 wide. We've lost 3 times in the league already, but the last win was a thumping 5-0 win over Red Star who were in Ligue 1 with us last season. 3 wins and 3 draws isn't great, but you have to remember that our expectations are only "Top Half Finish". So far we are doing exactly that. There has been more than a bit of fine-tuning going on with the new tactic, but the last victory suggests that we are on the right track at least. Since when were reserve sides allowed above the 4th tier? That darn Qatari influence! I noticed that, (but only this season). Money talks as with everything. PSG get what they want, when they want, how they want. (35a) Iker (Bal) (2035) *. 6 appearances for (FRA) U20's including 1 assist. 11 appearances for (FRA) U19's including 5 assists and 1 goal. (35b) Renault (Temp) *. 1 appearance for (FRA) U20's. (36b) Borja (F.Amb) *. No appearances. (36e) Koldo (Det) *. 6 appearances for (FRA) U19's. (37a) Théo (F.Amb) (2037) *. 1 appearance for (FRA) U19's. We've scored 20 goals in 10 league games this season, (easy to work out that's 2 goals a game), and we are conceding less than 1 goal per game so things are looking rosy in that respect, but I'm a little concerned, (maybe not concerned but certainly interested), as to why everyone seems to be scoring apart from my strikers. Reta (ESP) (BAS) (F.Det) has cored 6 goals this season and 5 of those have been from the P(a) role as a lone striker, but no other strikers have scored when playing in a SC role. 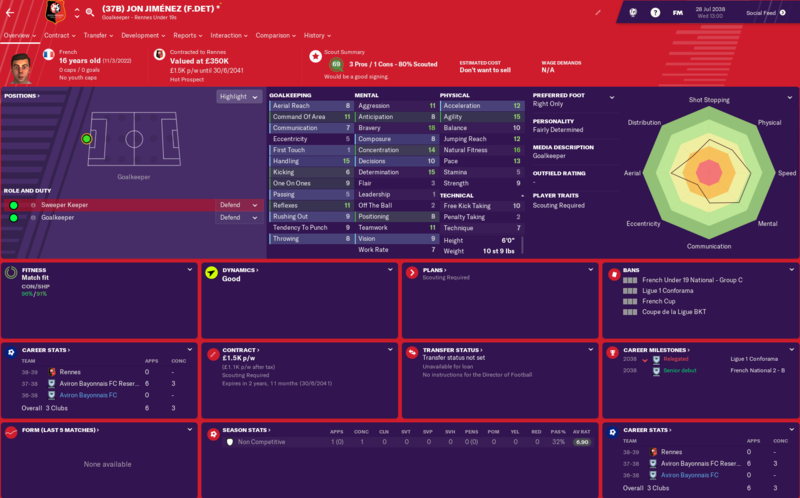 (34a) Merino (LHeart) (2034) * has scored 4 goals from midfield. I really want more goals from the striking position though and I will be playing with roles and instructions in order to get that. So we drew away with the French magnificence that is PSG, but I hadn't really thought it through because just 3 days later we were playing away against Toulouse, (To lose or not to lose. That is the question. Whether tis nobler in the mind......... sorry, where was I). This made me laugh... considering the context n'all. Gutted you went down however I think this will be a blessing. Nice start to the season, the side is a different animal to the one that last got promoted! Thanks. We've got more strength in depth now and whether we go up this season or not, we are certainly moving in the right direction. Not a great month, but Tours and Havre are 2nd and 3rd respectively and in very good form. (34b) Mikel Ochoa (Bal) *. 3 appearances for (FRA) U19's. 2 appearances for (FRA) U20's. (35a) Iker (Bal) (2035) *. 8 appearances for (FRA) U20's including 1 assist. 11 appearances for (FRA) U19's including 5 assists and 1 goal. (35b) Renault (Temp) *. 2 appearance for (FRA) U20's. (36b) Borja (F.Amb) *. 1 appearance for (FRA) U20's. (36e) Koldo (Det) *. 6 appearances for (FRA) U19's. 2 appearances for (FRA) U20's. Scoring goals hasn't been a problem with 4, 4 and 3 goals scored in wins, but we conceded 3 goals twice and 2 on another occasion and only managed to keep 2 clean sheets. We are obviously better at going forward than we are defending, and the potential of the squad and of the tactic itself seems to be very much attack-based. Although we are in 7th, 2 positions outside the Playoff positions, we are actually just 1 win and 3 points away. Ligue 2 Player of the Year. We were in Ligue 1 last season and Reta (ESP) (BAS) (F.Det) has only played 12(4) games scoring 8 goals and creating 4 assists in that time, but has still somehow won the award despite only playing in Ligue 2 for half of the last year. We still don't have a problem scoring goals, but again we're still conceding too many at the other end. 18 yo striker (36a) Dulce (Bal) (2036) * is developing nicely and has been rewarded with the Player of the Month award for December 2028. After a slow start he's scored 6 goals from 11(4) appearances. We're still in 8th position and still 3 points behind the 5th placed team. National A Licence. Jan 2039. The £30M loan is the same loan that we have taken out for the construction of the new stadium. I'm not positive, but this looks like the Youth Facilities that have been upgraded are those at the Bordeaux stadium. That wasn't what I had in mind at all. Hopefully you'll be able to sneak a playoff place this season, though it's a very strong 2nd division on paper this year! 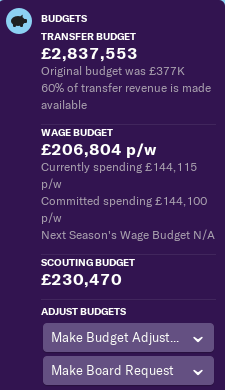 I've always liked how you build clubs realistically in your saves, as you don't mind focusing on facilities or selling young players if the offer is right. It's a shame the money spent on facilities seems to have been wasted though! Youth Facilities = newgens i.e. players age 8 (or whenever they start now) up to 16 when they appear in your youth intake. Think about it this way - when Spurs have been using Wembley as their “home” stadium they haven’t suddenly moved all their training and their academy out there have they? Yeah. Red Star came down with us and they are languishing in 13th place so although they were poor last season in Ligue 1, it acts as a decent benchmark for where we are. 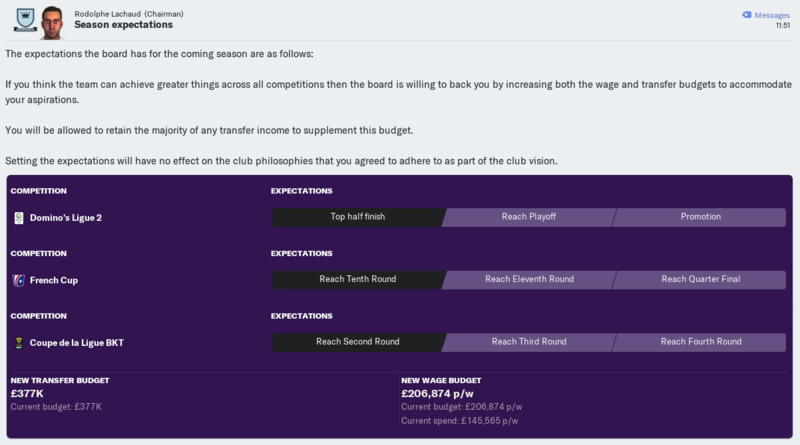 Harve came down the season we went up after spending 14 consecutive seasons in Ligue 1, so that's a lot of income over that period. A club like that should be very competitive when they drop down to Ligue 2. To give you an idea, although they have sold players to the tune of £16.5M this season, they have also spent £6.75M and those sorts of numbers dwarf us spending £0.5M over the whole course of this save and the only sale over £250,000 being the £3M we got for (37a) Théo (F.Amb) (2037) *. 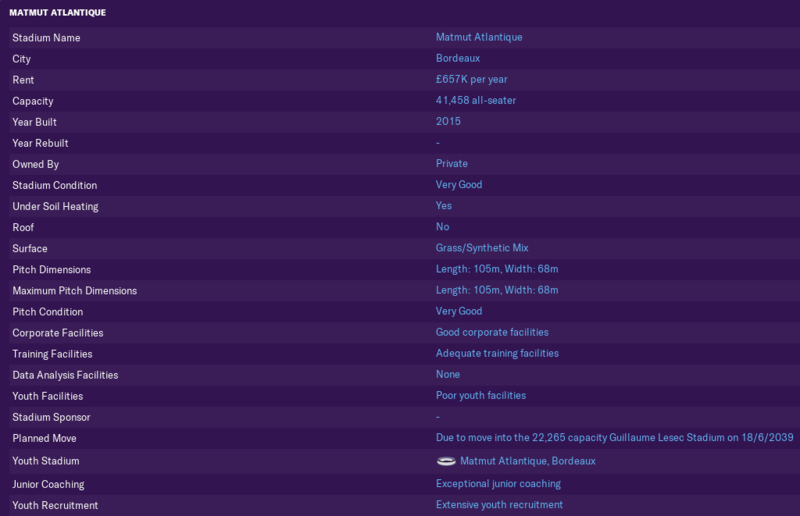 Tours, Lorient, Clermont and St Etienne are all established at Ligue 2 level while we are still playing players who came through the Academy at a lower level. 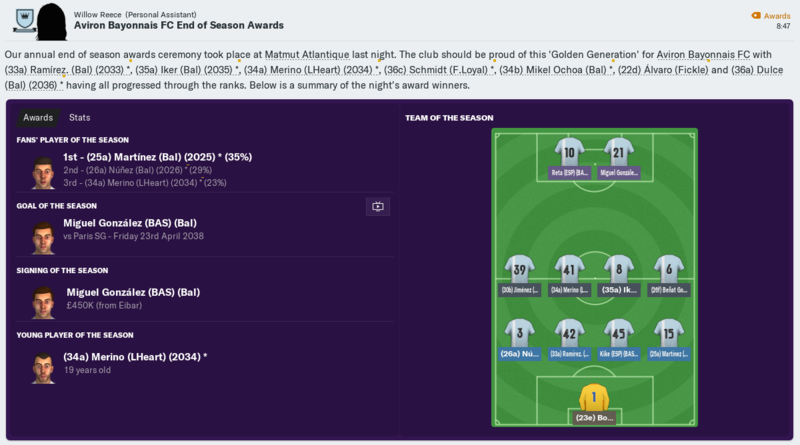 I'm not getting too caught up in an instant return to Ligue 1, (it's a marathon and not a sprint remember), but I will be honest in that my personal target for this season was to finish in a Playoff position. It would seem that we still jave some work to do in that respect. Yeah, you're completely right. I think what had happened is that I have been so busy upgrading the Youth Coaching and Youth Recruitment that I forgot to upgrade the Youth Facilities. Well not exactly forgot, but prioritised the former over the latter and THEN forgot that I still had to upgrade them. The following info is taken from Cleon's old Ajax thread and although it's a little out of date because it was written back in 2014, it's still the best source of info for this type of thing that I have found and I still find myself referring back to it on a regular basis. If you haven't heard of it then I urge you to take a look. On that note, Cleon has announced that he is updating his Ajax thread, (I can't wait), so keep an eye out for it on Tea and Busquets. There are loads of good blogs out there but Cleon's stands out not just because he knows what he is talking about, but because he has a knack of explaining things in a way that seem simple, but also make you think about things for yourself. Cleon's style seems to be about educating you so you can make your own decisions going forward, rather than just spoon-feeding you everything you need. 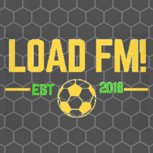 The Football Manager community of Twitter is really strong and although he also tweets about Sheff Utd and wrestling, he's well worth a follow. I'm far less worthy of a follow, (and I tweet about Barnet FC and politics, but I can be found here. 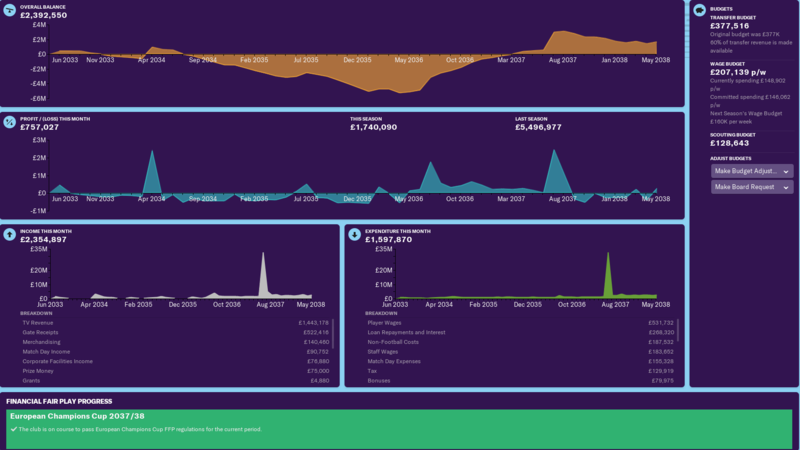 #WeStreamFM is a hashtag well worth keeping an eye on. So getting back to the save, here are our facilities right now. Corporate Facilities. Good (level 13-15). I've never really looked at these and I'm not even sure that we can ask about this at board level. Once everything is maxed out thought i will certainly be having a look at this. Training Facilities. Average (level 10-11). This is important, but it obviously comes in 3rd behind Junior Coaching and Youth recruitment. Youth Facilities. Basic (level 1-3). This is what I'm going to be concentrating on upgrading as a priority. because it's still at a low level, it should be pretty easy and cheap to upgrade. 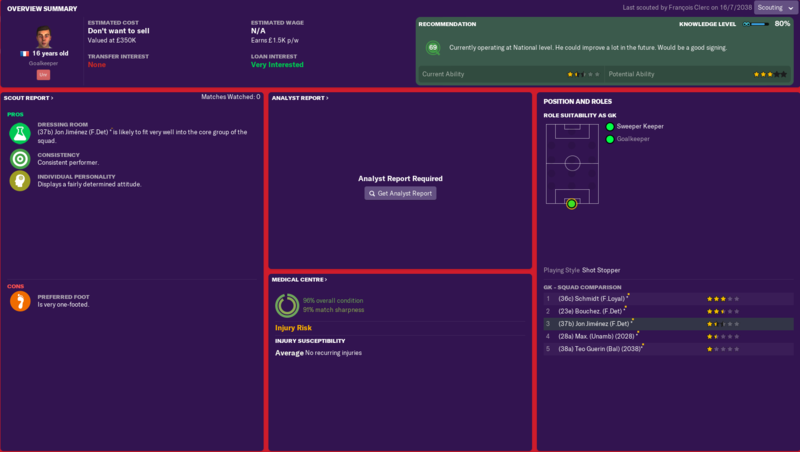 The other thing to consider here of course is that my best players never really spend much time using Youth Facilities because I stick them straight in the Senior squad, (so they use Training Facilities rather than Youth facilities, (I think), and then I just make them available for the U19's games. Junior Coaching. Exceptional (level 20). I love that this is maxed out and this relates to player CA. Youth Recruitment. Extensive (level 19-20). I have a feeling that this has already been upgraded at Extensive so that suggests that it's level 20 rather than level 19. That will do me nicely. This obviously relates to player PA. our new stadium looks like when it's built, (even if it's not named the Jimb O'Kav Park). 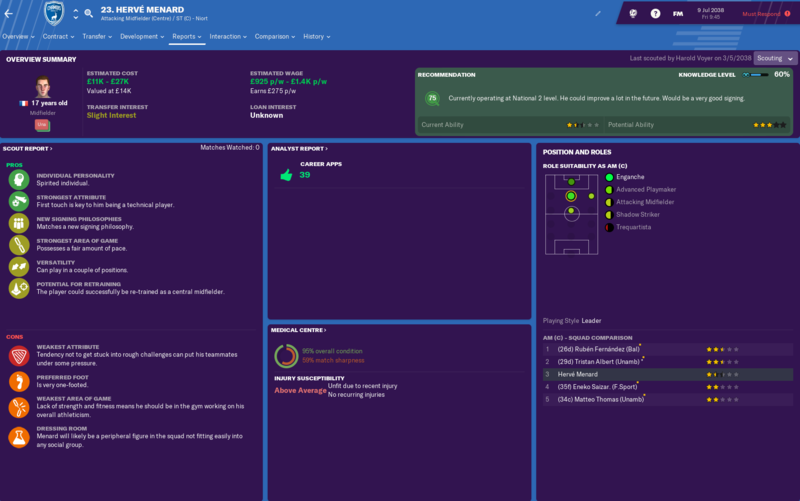 It's a good thread, yeah I'm holding off on doing a youth development save until he does his updated thread as I haven't really got the hang of the training module. I don't really do twitter much except to watch highlights on BT Sport and the like's pages. That bit I put bold and in italics about youth facilities in the quote - it's wrong. U19s, Reserves, 1st team all use Training Facilities. Youth Facilities is another one only related to the production of newgens. I'm not sure I agree unfortunately. I know that someone has said something that he believes to be true, but while he has a fancy badge next to his name, it means that he is a moderator on an internet forum rather than someone who has some sort of inside info into the inner-workings of the game. If Seb has said it then I'm sure it's true, but I will wait until I see it for myself. What I have noticed however is that the online manual has been updated and while a lot of the info in the actual game are still to be changed, the manual has been updated. Facilities directly affect player development. An increase in quality of training facilities allows player attributes to develop more, allows them to become more likely to realise their full potential, improves the rate at which they progress, and also improves the coaching staff working there, which in turn benefits the players again. The same applies to youth facilities; the players and coaches working in this part of the club will reap many of the same benefits at a markedly more important time in their careers. If you read these together then I think it makes sense. If an U19 player is in the Senior squad then he isn't going to be using the Youth Facilities. He's going to be using the Training Facilities. I know that @herne79is saying that all players train at the Training Facilities, but that's not my experience in terms of player development where there is a significant difference between Youth Facilities and Training Facilities. I particularly don't agree with his later comment where he advises "I'd try to keep them all at roughly the same level. So I'd take a look at which is my "worst" area and improve that first." Youth Facilities influences the development of players in the Youth squad. Training Facilities influences the development of players in other squads. I was trying to think what I had based my opinion on, (other than my own experiences), so as usual I referred to the Ajax thread to see what it would tell me. That's what has set me thinking along these lines and I have seen nothing since then that has made me change my mind. Actually @zlatanera I have found the thread you were talking about and the comment from @Seb WassellThat is indeed interesting and what he says carries significant weight. I will obviously be testing this out and reporting back. Thanks for taking the time to comment and point this out. Really appreciate it. That's a good distinction to make, I can't blame you for suspecting someone would be misled by an official-looking badge. This mod does seem to know what he's talking about generally. I also don't do them all at the same level - always Training Facilities first, got to make the most of what you've got! We crashed out of the Cup to high-flying Lorient, but bounced back with clean-sheet wins against Gaz Ajaccio, Nimes and Red Star. The only poor result in the league was away to Paris who comfortably turned us over. Apologies but I forgot to post the update until after the Red Star game. We're up into 4th now, but are a full 8 points behind Havre in 2nd, but only 3 points behind Lorient. Some of us mods do actually have inside info, especially the Tactics & Training forum mods of which I am one. In this particular case, I have had direct involvement with SI in pulling together information about training so everything I say on this subject, such as that quoted above, has been discussed with and vetted by SI. And if there is a grey area I'll confirm things with SI before posting. So by all means disagree if you like but Youth Facilities forms part of the newgen process and Training Facilities is where all of your actual players - from Youth Team through to Senior Squad - train. We may not be employed by SI, but we do tend to be more than just a fancy badge. Apologies if I caused offence @herne79It was more based upon Mods in internet forums in general rather than your particular case or even in general in here. In this instance however, I was able to find the post that @zlatanerareferred to above and it absolutely backs up and confirms your post so thanks. That's what I like to see. No goals against. We are within touching distance of 3rd place, and if you remember 3rd place is guaranteed an easy route to the Playoff Final against the 3rd bottom Ligue 1 side. The training facilities available for all visible players at the Club, senior and youth. The quality directly impacts upon player progression and training injuries. The Club’s recruiting of Juniors, those of home and foreign origin. Impacts upon Newgen quality. The facilities available for Juniors only. Impacts upon Newgen quality. The quality and quantity of Junior Coaches at the Club. Impacts upon Newgen quality. "Impact upon Newgen quality" = both CA and PA. Youth Intake Day. Mar 2039. "Looks like he could possibly emerge as one of the best players of his generation". Interesting, especially considering he is only rated the 2nd highest player by PA. If 1x 5.0 PA player is the benchmark for a good intake day, then 2x 5.0 players is obviously great even before we look at the 1x 3.0 CA, 1x 2.0 CA and 3x 1.0 CA players. The only player I haven't signed is (39m) Jesús Vera. (Cas). I really don't like the Casual personality. Low (Pro) is bad. Low (Det) is bad. Low (Pro) and (Det) in the same player is unforgivable. (39a) Jesús (Fickle) (2039) *. I don't really like "wrong-sided" players, but there is absolutely no doubt that some roles can be especially effective in different versions of the game. In my experience where as a central player in the AM line is a little under-cooked in FM19, the IF role is perhaps the other way around. Don't get me wrong, I could just refuse to play him "wrong-sided", re-train him to play on the right and then train him as a winger, but I'm actually asking my wide players to swap, so if I want them to swap, (so that they are both effectively "wrong-sided"), then I can't really ignore players who are more suited to playing that way. I should also mention that in my 1st choice team at the moment we have a SC playing at AMR and he's obviously wasted being asked to stay wide. Wow. No wonder he is labelled a "Generational Talent". He's very good now at 14 years old. He's instantly rated the 2nd best striker at the club by PA, (which is astonishing considering the level we are playing at). He's very very very very good and will go straight into the team as soon as he is old enough. I'm REALLY excited by this bloke. Xabier looks some player already with no real weaknesses and a good personality. Does promising still refer to a high PA or just an reasonably high CA. Since you can't play him until 16 (i think), is there a chance he could be snatched before you play him? I'm honestly not sure what the "promising" tag means anymore. I had decided that it didn't really mean anything in the past and that there were as many times that it was misleading as it was an indication of hidden talent. Now I'm just ignoring it if I'm honest. With regards to either (39a) Jesús (Fickle) (2039) * or (39b) Xabier (Res) * getting poached from me with nothing but compensation in return, I have learned my lesson from losing (37b) Jon Jiménez (F.Det) * to Rennes for £550,000 compensation earlier this season and both of this years starlets have already signed not only youth contracts, but also signed pre-contract professional contracts for a 3 year period that will kick-in on their 16th birthday. 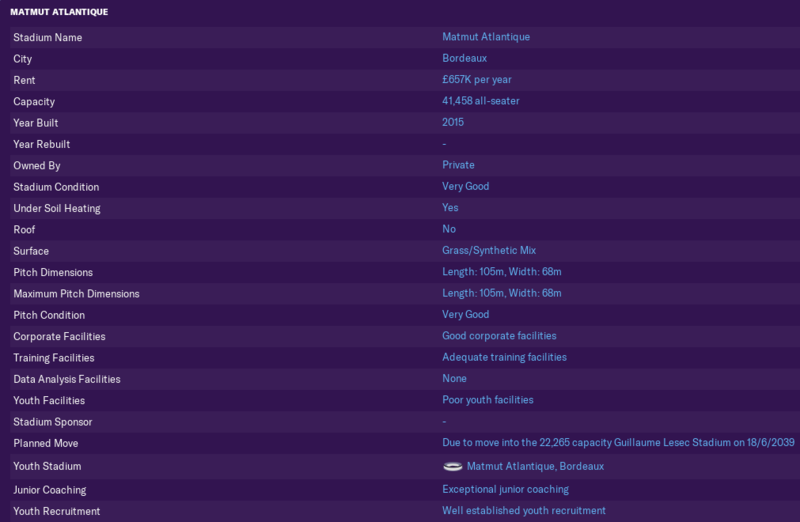 The only real negative in doing this is that you can't add +3 year options on at this time, (well I can but if I do I am unable to activate them), because a player has to be 16 when a contract is signed for these clauses to become active. 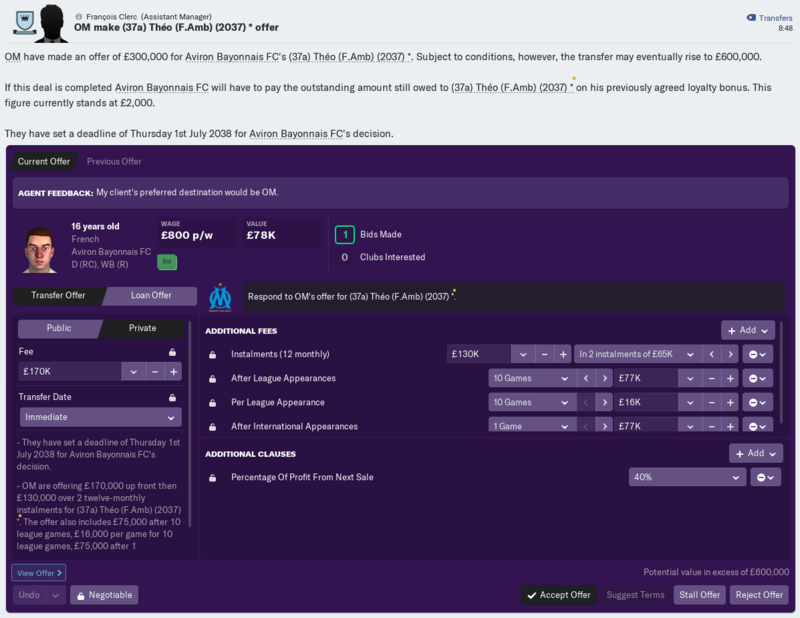 If you offer the deal before this time then while they are in the contract and visible, you will never be able to trigger them and activate the +3 year deals. So on the plus side they are here for 3 seasons after they turn 16. Xabier Only 14 years old! What a talent is that. Hopefully you can keep him at your club! (35b) Renault (Temp) *. 2 appearance for (FRA) U20's. 2 appearances for (FRA) U19's including 1 assist. (36b) Borja (F.Amb) *. 1 appearance for (FRA) U20's. 1 appearance for (FRA) U19's. (36e) Koldo (Det) *. 2 appearances for (FRA) U20's. 8 appearances for (FRA) U19's, including 2 assists. Yeah, he looks decent. 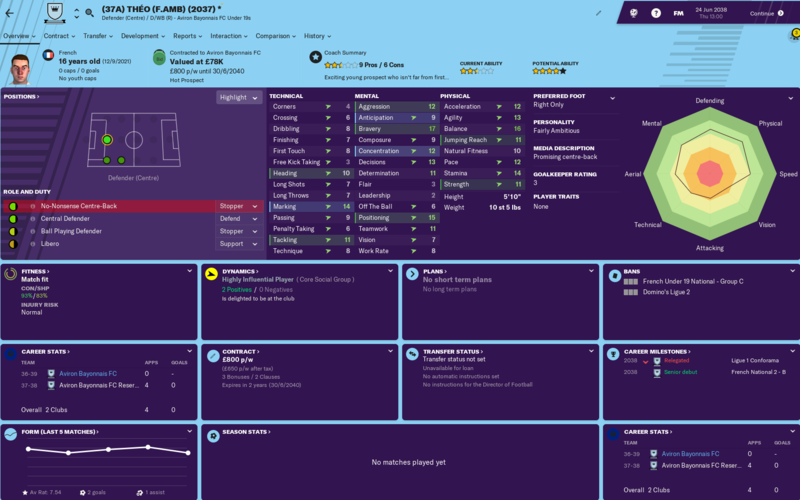 Already signed him to a pre-contract deal so have got him for 5 years at least, (albeit that he can't play for 2 years). I will look to upgrade his contract as soon as he turns 16 so that I can add a +3 year option. As long as we are in Ligue 1 at that time then it should be doable.